Do you know the answers to these questions? What did Prince William forget to do on his wedding day? Which King spent his coronation gesturing to his mistress? How did a pair of cufflinks spell disaster for Princess Diana? What was the name of the Queen’s first corgi? 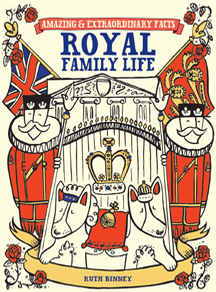 You’ll find the answers in Amazing and Extraordinary Facts: Royal Family Life , which unearths a wealth of curious truths about British royal domestic life, royal celebrations, royal etiquette, and the ways in which they have shaped history. Delve into the personal lives of the Royal family, past and present, from difficult childhoods to fashion icons, from love matches to divorces, and from unrehearsed coronations to assassination attempts, royal scandals and untimely deaths. Discover the facts about royal pets, royal sports and pastimes, royal yachts - all the detail that makes the lives of members of the royal family utterly compelling.